What’s new in the CEH v10? In response to the escalating threat of unsecured IoT devices – like 2017’s Mirai botnet attack - CEH v10 will introduce a new module focusing on Internet of Things (IoT) security. This module will provide professionals with the knowledge they need to test, deploy and manage the security of IoT devices. The new version of CEH will also introduce upgraded vulnerability assessment content. Vulnerability assessment is a critical element of the hacking life-cycle and v10 will increase the depth of application vulnerability analysis in real-world environments. Students will cover the tools required to assess systems, the tools hackers use and how to fix vulnerabilities. Professionals can expect an increased focus on emerging attacks vectors, like cloud technologies, AI and machine learning. Students will find themselves studying AI and Machine Learning to conduct vulnerability assessments in an effort to defend against malware attacks. The CEH v10 will also introduce students to the malware analysis process – the method for determining the functionality, origin and impact of malware through reverse engineering. The Certified Ethical Hacker (Practical) is an extension of the CEH certification. 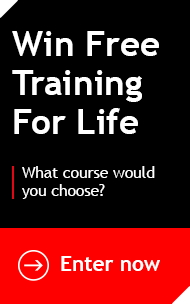 It's an additional and optional exam, available to candidates aiming to prove their practical knowledge by applying the skills taught within the CEH to a real-world security challenge. If you possess the CEH, you'll be able to sit the exam and EC-Council suggest this will test the limits of their student's abilities. The Practical exam is a rigorous 6-hour test designed to mimic a real corporate network by using live virtual machines, networks and applications. How can I take the CEH v10? 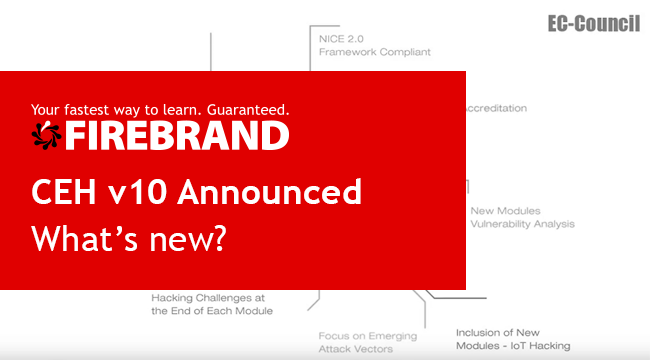 While you can’t take on and achieve the CEH v10 yet, Firebrand is already moving to incorporate the new curriculum into accelerated CEH courses. Stay tuned for an official release date for the CEH v10.